The last few weeks in that utero is really tight quarters! Your baby may end up in a position that is less than ideal for their developing muscles. I’m sure I don’t have to tell you that. All third trimester mommies are well-accustomed to an elbow in the ribs, a foot on the bladder. 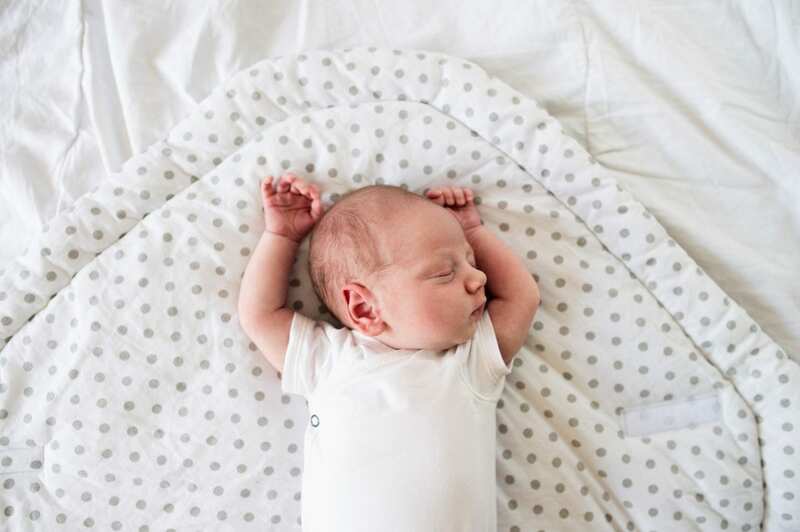 It is important to take careful note of your newborn baby’s movements. Are they moving both sides of their body the same amount, are both legs kicking and flexing, and is their head turning fully in both directions? It’s time to start thinking about torticollis. Torticollis is a term you may have heard. It is a strange word that evokes scary feelings, but if noted and addressed right away it is very treatable. Torticollis is really just a tight neck. You know how when you fall asleep on a plane or train with your head against the window…well imagine being in that position for several weeks. The muscles on one side of your baby’s neck tighten, while the muscles on the other side lengthen. You will notice that your baby prefers to look one direction over the other and their chin may be tilted to one side all the time. If you suspect your baby has a tight neck on one side, it is a good idea to point it out to your pediatrician as soon as possible. They will evaluate her neck muscles and either give you some gentle stretches and exercises to do, or recommend you for therapy. It is really smart to treat it right away so it doesn’t get worse or result in a flat spot on your baby’s head from always being turned in the same direction. Sometimes pediatricians might take the “wait and see” approach, but it never hurts to start some light intervention before it gets any worse. The best way to encourage your baby to turn his head to the opposite direction is to always be on that side of him, talking to him and encouraging him to turn his head to look at you. Use visually-stimulating objects to get his attention. I love using something simple like a playing card. The black, white and red contrasting colors on a nine of hearts or a three of spades are great to get your baby to focus. You can lie him on his back and start with the card or toy on his preferred side, then move it slowly in an arc infront of his face about 8-10” away from him encouraging him to continue to scan it, turning his head to watch it move across his visual field. If he stops his head halfway, you can do some very gentle stretching by sliding your hands under his head and gently turning his head the opposite direction. If he fusses or tries to turn his whole body with his head, give him a break. You do not have to turn his head with any force, just move it slowly and gently, and if you feel uncomfortable doing this, ask your pediatrician for a referral for therapy. You can also use gravity to help stretch out those tight neck muscles. Every time you pick your baby up from her crib or changing table or any surface, always turn her toward the opposite side first, then lift her from her side so gravity helps to bring her head into alignment every time you lift her. Tummy time is also great for normalizing neck alignment. When babies spend time on their tummy all their neck muscles are activated. Try to get down on his level and make eye contact and encourage him to turn his head to the opposite side. Think about how she is positioned and try to position her so she has to turn her head the opposite direction to see the action. You could also roll up a small washcloth and place it along the side of her head to help her turn the other way, or even roll a small blanket and prop her slightly from her back towards her side so her head turns toward the floor. Feed your baby from the side he needs to turn toward to encourage him to look over that way. You can even breastfeed from the side by using the football hold with the baby tucked under your arm so he has to turn his head the opposite direction to eat. Like most things with babies, the key to remediating torticollis is to intervene early and to be consistent. Cow’s Milk or Goat’s Milk: What’s Better for my Toddler? Is it Colic or Acid Reflux?